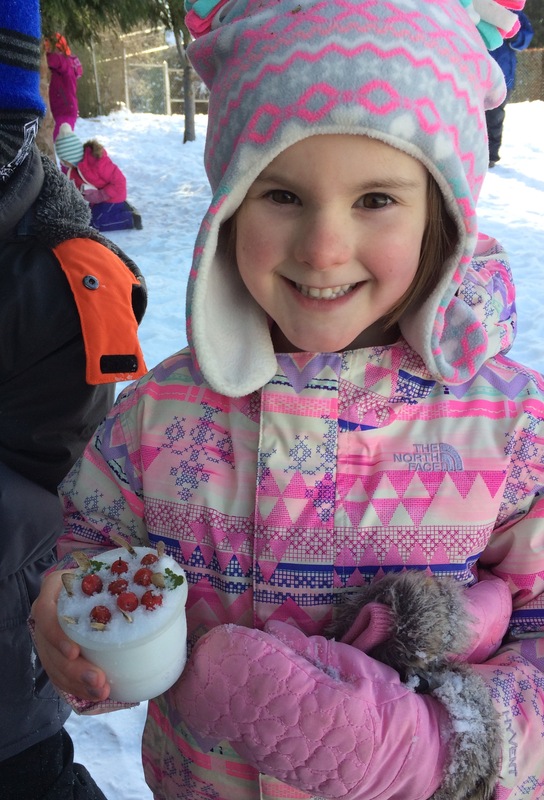 This winter, over 3,000 students from 148 Kindergarten to Grade 3 classes throughout the Columbia Basin stepped out of their classrooms and into the magical world of Winter Wonder, where they discovered the awe of the season and why it is so important for our local ecosystems. Judging by the rosy-cheeked smiles on everybody’s faces, amazing days out were had by all. A rosy-cheeked smile from Kinnaird Elementary in Castlegar. And for those of you wondering, yes, the amount of extra wonder that fell this winter did not go unnoticed. From the vantage point of shoulder high snow, it becomes a lot easier imagining what it’s like to be mice in subnivean tunnels; seeing the adults sink noticeably further than the kids provides a gateway to discussions on how local animals have adapted to get around on top of the snow. 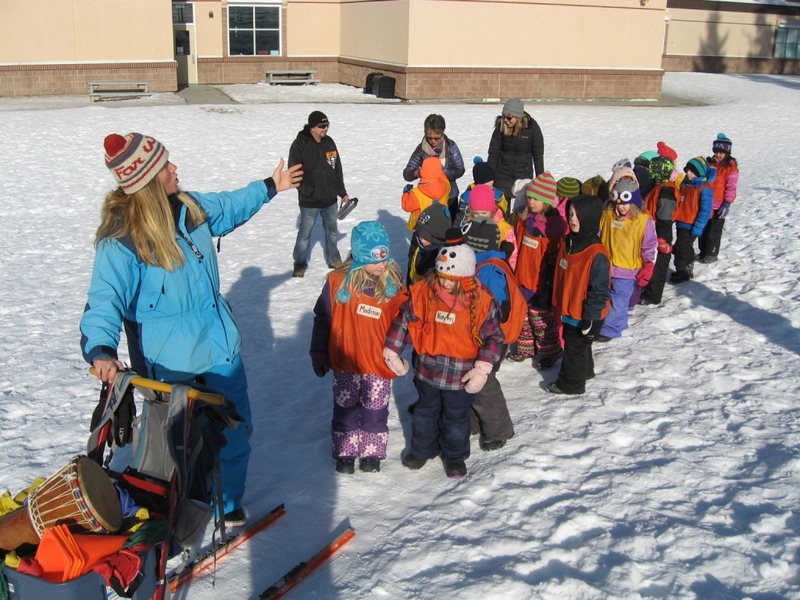 Students from Kootenay Orchards Elementary in Cranbrook are all lined-up and ready for an outdoor learning adventure. Patty was recently recognized by Columbia Basin Environmental Education Network for their 2017 Awards of Environmental Education Excellence, and she was not the only Winter Wonder educator honoured this year. Janette Vickers, a Wildsight educator from Revelstoke, was also named as a recipient of the award—capping off another fantastic season of Winter Wonder and highlighting once again the power of outdoor education. 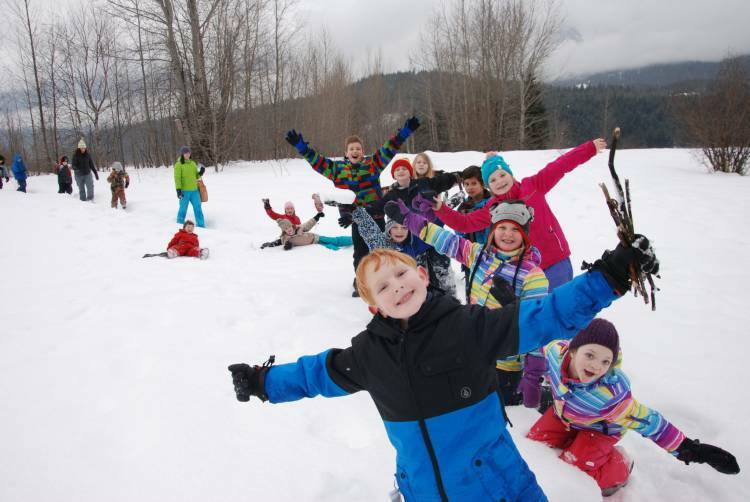 Students from Begbie View Elementary in Revelstoke spread their wings. There is something special that gets unlocked when you bring kids out in nature to experience learning in an engaging, hands-on and immersive way. And this Kootenay winter provided yet another remarkable platform for revealing the many layers of wonder to be found on the other side of the windows we all find ourselves staring out of. Wildsight gratefully acknowledges the financial support of: Columbia Basin Trust / BC Gaming Commission / FortisBC / Teck Coal for the Winter Wonder program.